Yoga at the Village, Still Going Strong. Some of you have been around long enough to remember this awesome news story. 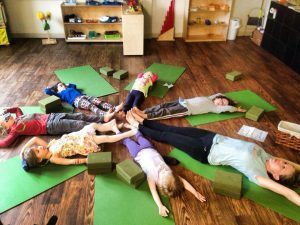 But some of you may have missed it, even though you know all about your little ones learning new Iyengar yoga poses with Miss Michelle every Wednesday morning. Below, please find a link to the TV news spot featuring Village Montessori and our formal implementation of a yoga program for our students. We started the program when we launched the school in the Fall of 2013. It’s part of who we are and what we believe. And we are thrilled to say, it’s still working!